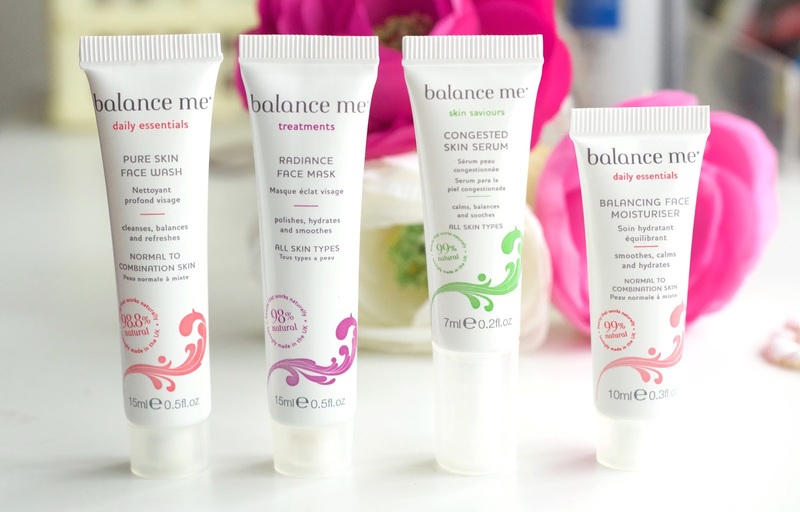 Balance Me was a brand that I’d heard about but never tried until this little skincare set arrived through my door. When I preordered my Look Fantastic Beauty Secrets Advent Calendar, they had an offer on where you got this Balance Me sample set for free when you spent a certain amount… bonus! Now I’m usually rather sceptical when it comes to trying new skincare products, I tend to stick to the ones I know and love as I hate trying new products and reacting to them. The thing I really like about this brand is that their products are mostly natural, which is something that really draws me into products. The brand was founded by two British sisters (go girl power!) back in 2005. They’ve really challenged what natural beauty stands for and created products that wouldn’t have been possible a few years ago. They’ve since earned themselves a lot of praise in the media and by various celebs. I was actually really excited to give these products a try, and I wanted to share my opinion on them with you. This face wash is a fairly basic, it cleans the skin nicely without leaving a film or drying out my skin. It leaves my skin feeling really soft and hasn’t irritated my skin or broke me out. Whilst it is a nice face wash, I prefer cleansers and balms so I can’t see me repurchasing this. If you’re a fan of face washes and are looking for one thats gentle on the skin yet does a great job at cleaning and removing makeup then I think this one would be a nice one to try. I was in need of a new face mask, so this little beauty came into my life just at the right time. Nothing beats a lazy Sunday pamper evening with a face mask on watching YouTube videos with a hot chocolate probably all cosy under a blanket… is it Sunday yet? This face mask is said to cleanse, exfoliate and brighten dull skin making it smooth, soft and radiant to the touch… I couldn’t agree more! This handy mask has worked wonders on my face. It’s a clay mask that isn’t drying on the skin as it contains water and sweet almond oil. It also contains tiny pieces of walnut shell that gently exfoliate the skin. It’s very gentle and calming on my skin and doesn’t dry out my skin or leave me looking as red a a tomato. I really love this mask and I’m going to order the full size version when I’ve finished this one. This product has been a life saver for me. My skin has been rather troublesome lately so I needed something to help tackle these pesky breakouts. I find a lot of products aimed at treating blemishes can be very drying on the skin, especially on my incredibly sensitive face, but luckily this hasn’t been the case at all with this serum. It hasn’t irritated or burnt my face at all which is a big bonus. It’s a very light and slighty runny formula that absorbs quickly into the skin. I’ve been applying this to my t-zone and cheeks at night before moisturiser and I’ve already noticed a difference. My skin is a lot more under control, breakouts have calmed down and most of all this has worked wonders on my pesky pores. I can’t rave about this enough! This balancing moisturiser is really nice, and really helps to sooth and calm congested skin without striping away the skins natural moisture. It absorbs quickly into the skin and makes a nice base under makeup. I’d say this is better for those with oily/combination skin as it isn’t as hydrating as I’d usually go for. I can see myself using this more in the warmer months. Overall I’m actually really impressed by the brand. My favourites are the Radiance Face Mask and the Congested Skin Serum which I’d really recommend. I love that the products are fairly natural and work really well on my skin without irritating or drying it out. I can’t wait to try more from the brand! Hope you enjoyed this post! Have you tried anything from Balance Me?